Alfred Tennyson, 1st Baron Tennyson (August 6, 1809 – October 6, 1892) was the most popular English poet of the high Victorian age. A favorite of the royal family, Tennyson was appointed poet laureate by Queen Victoria and served for 42 years after the poet William Wordsworth. Like much Victorian literature following the Romanticism of Wordsworth, Samuel Taylor Coleridge, Lord Byron, John Keats, and William Blake, Tennyson's poetry turned from Romantic sentiment to a more stern, moralizing tone. Tennyson had a style far more attenuated, focused, and sober than that of those of the poets who had preceded him. In both style and attitude, Tennyson's verse strikingly resembled the poetry of Wordsworth's later years, to which it is often compared. Like Wordsworth, Tennyson was generally reserved in his political opinions, and his conservatism was evident in his choice of subject matter. Shying away from the fanciful poetry of the previous generation, Tennyson's material is largely grounded in the classics, and two of his greatest works (Idylls of the King and Ulysses) are concerned with two very old, very much respected legends of King Arthur, and Homer's Odyssey. Most of Tennyson's poetry is didactic. Like the fables of Aesop, they tend to have a moral or a point. Tennyson provides one of the most refined examples of what might be called traditional poetry, before the revolutions and upheavals that would attend the turn of the twentieth century. Alfred Tennyson was born in Lincolnshire, one of 12 children. His father, George Clayton Tennyson, a rector, was the elder of two sons, but was disinherited at an early age by his father, the landowner George Tennyson, in favor of his younger brother Charles, who later took the name Charles Tennyson d'Eyncourt. George Clayton Tennyson raised a large family but was perpetually short of money; he drank heavily and became mentally unstable. Tennyson and two of his elder brothers were writing poetry in their teens, and a collection of poems by all three was published locally when Alfred was only 17. One of those brothers, Charles Tennyson Turner later married Louisa Sellwood, younger sister of Alfred's future wife; the other poet brother was Frederick Tennyson. Tennyson attended King Edward VI Grammar School, Louth, and entered Trinity College, Cambridge in 1828, where he joined the secret society called the Cambridge Apostles, a society which would later include a number of noted scientists and philosophers (such as James Clerk Maxwell and Alfred North Whitehead) and which was originally founded as a society for the reading of Samuel Taylor Coleridge. At Cambridge Tennyson met Arthur Henry Hallam, who became his best friend. He published his first solo collection of poems, Poems Chiefly Lyrical around 1830. “Claribel” and “Mariana,” which later took their place among Tennyson's most celebrated poems, were included in this volume. Although decried by some critics as oversentimental, his verse soon proved popular and brought Tennyson to the attention of well-known writers of the day, including Coleridge himself. In the spring of 1831, Tennyson's father died, forcing him to leave Cambridge before finishing his degree. He returned to the rectory, where he was permitted to live for another six years, sharing responsibility for his widowed mother and his younger siblings. His friend Hallam came to stay with him during the summer and became engaged to Tennyson's sister, Emilia Tennyson. In 1833, Tennyson published his second book of poetry, which included one of his better known earlier poems, "The Lady of Shalott," a story of a princess who cannot look at the world except through a reflection in a mirror. As Sir Lancelot rides by the tower where she must stay, she looks at him, and the curse comes to term; she dies after she places herself in a small boat and floats down the river to Camelot, her name written on the boat's stern. The volume met heavy criticism, which so discouraged Tennyson that he did not publish again for ten more years, although he continued to write. The same year Tennyson's friend Hallam had a cerebral hemorrhage while on holiday in Vienna. His sudden death devastated Tennyson, but inspired him to produce a body of poetry that has become some of the world's most beloved verse. Tennyson began to write In Memoriam shortly after the death of his friend, a work that would take 17 years to complete. In 1842 he published the two-volume Poems, the first of which included works already published, while the second was made up almost entirely of new poems. The Poems, which included the The Lady of Shalott, The Lotus-eaters, Morte d'Arthur, and Ulysses among other verse, established his reputation as a writer. The Princess, which came out in 1847, was also popular. Also in the same year Tennyson married Emily Sellwood, whom he had known since childhood, in the village of Shiplake. They had two sons, Hallam—named after his friend—and Lionel. Probably more than any other poem, this poem defines Tennyson's career both in its simplicity and its enduring popularity. The poem is relatively short, numbering only 55 lines and six stanzas. Other works written as Laureate include “Ode on the Death of the Duke of Wellington” and “Ode Sung at the Opening of the International Exhibition,” and the popular Idylls of the King. Queen Victoria was an ardent admirer of Tennyson's work, and in 1884 naming him Baron Tennyson, of Blackdown in the County of Sussex and of Freshwater in the Isle of Wight. He was the first English writer raised to the peerage. A passionate man with some peculiarities of nature, he was never particularly comfortable as a peer, and it is widely held that he took the peerage in order to secure a future for his son Hallam. Tennyson continued writing into his eighties, and died on October 6, 1892, at age 83. He was buried at Westminster Abbey. He was succeeded as 2nd Baron Tennyson by his son, Hallam, who produced an authorized biography of his father in 1897. Recordings made by Thomas Edison of Lord Tennyson reciting his own poetry have survived, but they are of relatively poor quality. Tennyson was the most popular poet of the Victorian age. Turning from Romanticism of the previous generation, Tennyson expressed the values and aspirations of the Victorian age by looking to the heroic past, both in ancient legends and in recent British military history. Perhaps his most enduring and influential work, "In Memoriam," was a prolonged meditation on religious belief, modern science, and the significance of individual life. Rejecting conventional elegy as too formalistic to render the experience of grief and loss, Tennyson moves from despair through doubt and ultimately to faith. 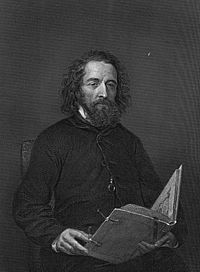 History of "Alfred Lord Tennyson"
This page was last modified on 4 March 2016, at 17:41.